Various throughput’s are obtainable depending on the feeder screw pitch, aperture size of the screen and characteristics of the product to be sifted. 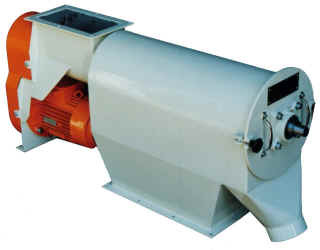 From the feed hopper, material is positively fed by means of a screw feeder into the sieving chamber where a brush or beater blade assembly revolves inside a stationary cylindrical screen. The throughs of fines pass through the sieve and are discharged, the tails of foreign matter retained inside the screen are discharged from a separate outlet. Various retention times can be obtained by the fitting of restricting rings at the tail end of the sieving chamber. The standard machine is fabricated in mild steel and is available with either a perforated metal or nylon mesh screen. The machine is driven via v-belts connected to an under slung integral motor. Depending on the type of application, either brushes or beaters can be fitted to the four beater assembly. Various hopper and over-tail spout options can be included so as to enable the sifter to be mounted in a variety of positions. The machine is of rugged construction with easy access for cleaning and maintenance. The BSRA is designed as an all purpose sieving machine idea for granular and powder processing industries. The BRSB is a larger range of machines for high capacity processing. Stainless steel construction, extended auger, food quality/pharmaceutical finish, outrigger bearings, various hopper/outlet configurations, outlet feeder c/w separate drive, outlet screw conveyor.